Sunday, Aug 12, 1888 Less cool, & more pleasant again. 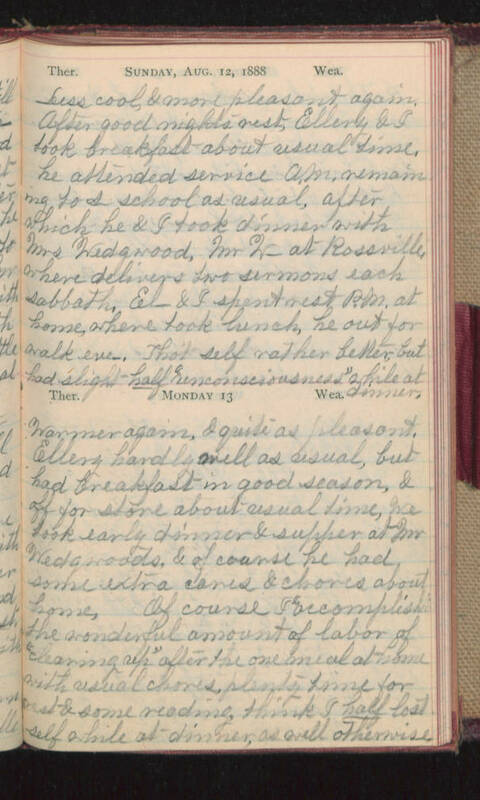 After good nights rest, Ellery & I took breakfast about usual time, he attended service A.M. remaining to s-school as usual, after which he & I took dinner with Mrs Wedgwood, Mr W- at Rossville, where delivers two sermons each Sabbath. El- & I spent rest P.M. at home, where took lunch, he out for walk eve. That self rather better, but had slight half "unconsciousness" while at dinner. Monday 13 Warmer again, & quite as pleasant. Ellery hardly well as usual, but had breakfast in good season, & off for store about usual time, we took early dinner & supper at Mr Wedgwoods & of course he had some extra cares & chores about home. Of course I "accomplished" the wonderful amount of labor of "cleaning up" after the one meal at home with usual chores, plenty time for rest & some reading, think I half lost self while at dinner, as well otherwise.